Banana Monkey Video Slot Guide & Review - Casino Answers! Banana Monkey is a 5-reel, 20-line video slot developed by Playtech, featuring wild symbols, scatter wins, multipliers, a gamble feature, a free spins feature and a progressive bonus game. You can play the Banana Monkey video slot game at Casino Del Rio and Omni Casino. 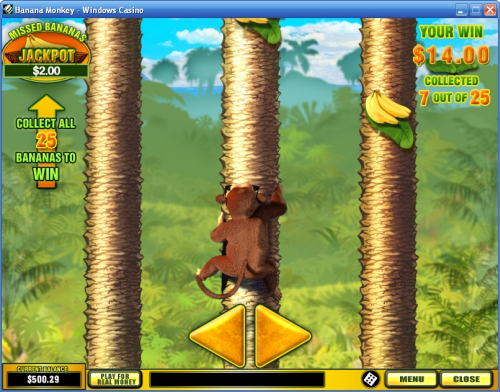 To play the Banana Monkey slot machine, you must first choose your coin size. Coin sizes available are $0.01, $0.05, $0.10, $0.25 and $0.50. Once your coin size is chosen, you can then choose the number of coins per payline (up to 10) under “Bet Per Line” and the number of active paylines (up to 20). The lowest total bet you can make on Banana Monkey is $0.01 per spin, with the highest total bet being $100 per spin (for those not looking to monkey around). Banana Monkey is an excellent video slot for casual players as well as high stakes casino players. To play the Banana Monkey video slot with 20 paylines and 10 coins, use the “Bet Max” button. To play the Banana Monkey casino game with your wagering settings, use the “Spin” button once you have set your bet. To win the 2500 coin top jackpot, you must hit 5 Wild symbols on an active payline. The Wild symbol is stacked on all reels and substitutes for all symbols except scatter and bonus symbols. 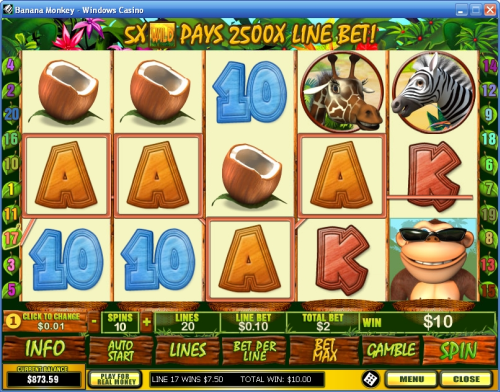 The second highest payout on the Banana Monkey slot is the Zebra symbol. 5 Zebra symbols will you 1000X your bet per line. Whenever a Banana symbol appears, it will drop into a basket below the reel. If you are able to collect 4 Bananas under one of the five reels, you will win 3X the total bet of the spin and 8 free spins. The number of Bananas in the basket will remain the same if you exit and re-enter the slot game. Banana collection is per total bet. Baskets are filled separately for every total bet played. When you return to a previously used total bet, the number of the Bananas in each basket on that bet amount will be restored. If a Banana appears during the free spins feature, you will automatically win 4 additional free spins. More Wild symbols will be added during the free spins feature. The bonus game cannot be triggered during the free spins feature. After any win on the Banana Monkey slot game, you will be given the opportunity to use the gamble feature to double or double half of your winnings. In the gamble feature, the dealer’s card is opened on the left. You must choose a higher card out of the four remaining cards. To exit the gamble feature, use the “Collect” button to collect your winnings. There is a double up limit listed in the game’s paytable that will vary depending on the casino you are playing at. Banana Monkey has a couple of additional in-game features. It has a basic autoplay feature where you can play up to 99 autoplay spins. You can cancel the autoplay spins at any time. There is also a skill stop feature that can be used at any time during a spin. If you like a good monkey slot, you’ll have fun playing the Banana Monkey video slot. It’s got one of the better Playtech bonus games in addition to some other good special features. If you’re looking for a great online casino to play the Banana Monkey slot game at, we suggest you take advantage of the 100% up to $100 signup bonus at the world’s first eco-friendly online casino, Casino Del Rio. Are USA players able to play the Banana Monkey video slot? Unfortunately, players based in the United States of America are unable to play the Banana Monkey slot machine for real money. For a similar themed USA-friendly video slot, we recommend you read our Magic Monkey Slot Review, which you can play at Caribbean Gold Casino. How do I trigger the Banana Monkey bonus round? To trigger the Banana Monkey bonus round, the Banana Monkey must appear on reel 1, 3 and 5 at the same time. How do I get free spins on the Banana Monkey slot game? To trigger the Banana Monkey free spins feature, you must collect 4 Banana symbols below a reel. Once you trigger the free spins feature, you will win 3X the total bet of the triggering spin in addition to the 8 free spins you will get. Where can I find a guide to Banana Monkey Video Slot? What are the rules to the Banana Monkey Video Slot game? What does the Banana Monkey Slot Machine Bonus Game look like?